A congregation rejoices when a new child is added to its midst, yet the church often wrestles—in both theology and practice—with how to best receive and minister to infants and children entrusted to her care. > How are infants and children impacted by sin? > How does God treat people who die in their infancy or childhood? > When and how are children considered members of the church? > When and how are children instructed in Christian doctrine? 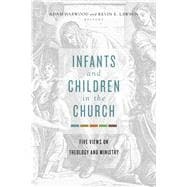 Infants and Children in the Church addresses these critical and sensitive questions from a variety of rich traditions, including Eastern Orthodox, Roman Catholic, Lutheran, Reformed, and Baptist, so that Christians can make the most of every opportunity as they minister to children.